Kyphosis Exercise to Help You Stand Tall! Kyphosis Exercise to Help You Stand Tall Again! If you have postural kyphosis exercise can do a lot to help you stand up straight again. Kyphosis or "hunchback" as some people call it means you have a rounded upper back that may be caused by something as simple as bad posture and slouching. Generally people develop kyphosis from too much sitting. This contributes to weak abdominal muscles and tight hamstrings in the back of the legs. This combination causes us to slouch and, over time, develop kyphosis. The good news is that there are several exercises to help kyphosis. See some of my exercises to improve posture here. The goal for kyphosis exercise for postural problems is to stretch the tight areas like the chest and hamstrings and to strengthen the weak areas such as the upper back and abdominals. This kyphosis exercise can be helpful to stretch the tight and overly developed chest or pectoral muscles. 1. Lie on a mat with your knees bent and hands placed at the base of your skull. 2. Keep your shoulder blades and ribs connected to the mat and gently press your elbows down towards the floor feeling a pull across the front of the chest and under the armpits. 3. Release the elbows and then repeat for 5-8 times until the muscles release their tension. Note: This exercise can be done by rolling your upper back over a rolled up towel, exercise mat, or foam roller for extra opening of the chest. This is a more intense version of the Chest Stretch above. It offers the added strength and stretching resistance of the exercise band. This exercise helps to strengthen the upper back while at the same time stretching the muscles of the chest, including the pectorals. 1. Lying on the mat with your knees bent and your hands holding the band shoulder width apart and directly over your chest. 2. Inhale as you pull the band wide across your chest reaching your arms straight out to your sides like a "T" feeling the shoulder blades draw towards the spine. 3. Exhale as you slowly release the tension reaching back over your chest to the start. Repeat for 8-12 repetitions. 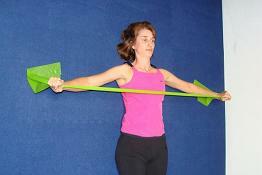 See more of my exercises with a stretch band here. This exercise is helpful to stretch the hamstrings in the back of the upper leg so they stop pulling on the back causing us to round forward. 1. Lying on your back with a rope or band wrapped around one foot and the other leg long and anchored to the mat. 2. Tension the strap and exhale as you bring your leg up until you feel a pull in the back of the upper thigh. Hold for 2-3 seconds then release to the floor again. 3. Repeat this for 6-8 repetitions on each leg trying to get a little more stretch each time. Pilates exercises are designed for length/tension imbalances in the body. This makes it the perfect kyphosis exercise because these imbalances are what you are dealing with if you have kyphosis. The exercises shown in the Pilates ebook available here are perfect for realigning the spine and teaching you good posture and abdominal control. The Stretch Band Rowing Exercise to the left shows just how to work the muscles of the upper back and stretch the chest at the same time in an upright position. Someone who has weak abdominal muscles, tight chest muscles and hamstrings, and a weak and overstretched upper back. The beauty of Pilates is that it can work the core or abdominal muscles while simultaneously stretching and balancing out the imbalances of muscles in the spine. Leave Kyphosis exercise and find out more about how Pilates exercises can benefit your back. Find out more about how breathing exercises can help you to release the tension in your back and allow you to stand taller and move more freely. Learn these upper back strengthening exercises to help realign and strengthen those muscles important for your posture.